2017 Monterey 360 Sport Coupe Adorned with cleverly designed seating, unlimited amenities and superior entertainment arrangements, both above and below deck, the 360SC is truly the first of its class. Our 360SC Coupe features a masterfully designed helm station with dual electric sliding helm/companion seats, dual wet bars, located both port and starboard, and an open seating area with L-lounge and cockpit table. Below deck a luxuriously appointed cabin awaits you with generous accommodations, featuring a spacious v-berth which converts from a comfortable bed to a dinette and seating area with solid wood table, and fully equipped galley. Beautiful full windows adorn the interior of the cabin allowing you to never miss a moment while underway. THIS BOAT IS LOADED WITH OPTIONS INCLUDING VOLVO EVC TWIN 380 DP WITH JOYSTICK CONTROL, OCEAN X DRIVES, COCKPIT AC, STAINLESS ANCHOR, ANCHOR WINDLASS ALL CHAIN, SEA DECK STORM BROWN TEAK, UNDERWATER LIGHTS, AFT BIMINI W/ BOOT, WOVEN RUNNERS AND COCKPIT CARPET, COCKPIT GRILL, COCKPIT TV 22", ICE MAKER, STEREO UPGRADE W/ SPEAKER AND SUB, STERN MOUNTED REMOTE, 16000 BTU AC W/ HEAT, GEN 7.5KW AND MUCH MORE! 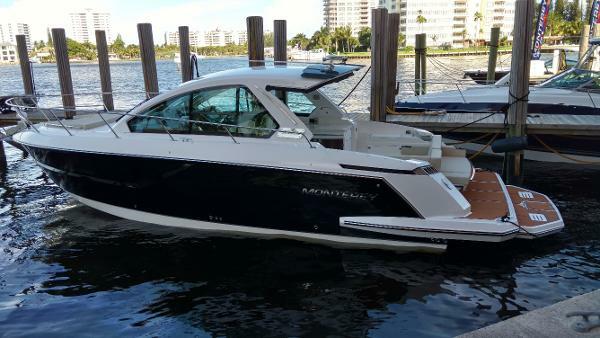 2016 Monterey 360 Sport Coupe Adorned with cleverly designed seating, unlimited amenities and superior entertainment arrangements, both above and below deck, the 360SC is truly the first of its class. Our new 360SC Coupe features a masterfully designed helm station with dual electric sliding helm/companion seats, dual wet bars, located both port and starboard, and an open seating area with L-lounge and cockpit table. Below deck a luxuriously appointed cabin awaits you with generous accommodations, featuring a spacious v-berth which converts from a comfortable bed to a dinette and seating area with solid wood table, and fully equipped galley. Beautiful full windows adorn the interior of the cabin allowing you to never miss a moment while underway.